The Information Technology Infrastructure Library (ITIL) is a framework of best practice approaches intended to facilitate the delivery of high quality information technology (IT) services. ITIL outlines an extensive set of management procedures that are intended to support businesses in achieving both high financial quality and value in IT operations. These procedures are supplier-independent and have been developed to provide guidance across the breadth of IT infrastructure, development, and operations. This workshop will introduce you to ITIL (Information Technology Infrastructure Library), the most widely accepted approach to IT service management in the world. 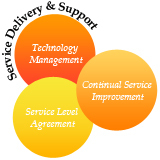 ITIL provides a comprehensive and consistent set of best practices for IT service management. Participants will understand how an integrated framework, based on ITIL best practice guidelines enables an organization to support and deliver quality IT services. This workshop will help participants prepare for the ITIL v3 Foundation certification exam from APMG. How to define the various ITIL processes that can be implemented in an organization. Benefits of implementing each ITIL process in an organization. Basic concepts related to each ITIL process. Activities and roles involved in each process. Relationship of each ITIL process with other processes. Factors that affect the effectiveness of each ITIL process. This workshop is meant for professionals responsible for IT Service Delivery / Support in any organization. Anyone aspiring to understand the requirements of the ITIL Framework would benefit from this workshop. Those who are working or have worked in an IT Service environment or equivalent will find this particularly useful.